The chemical blast in West Texas is a result of improper chemical storage techniques. The effect of the blast on society has led to new rule changes and different chemical storage regulations. Flammable chemical storage can be very dangerous and if not properly handled or stored, can result in death. The ability to store flammable chemical storage compliantly is in focus more than ever. The federal government has released new guidelines and has signed an executive order for new chemical storage regulations and flammable chemical storage guidelines in every state. The executive order illustrates how the West, Texas explosion was detrimental and how it could have been avoided. One measure of the new guidelines for ammonium nitrate storage is to “not store the chemical fertilizer in fire-prone wooden bins”. This is stating that wooden storage units are not a supplemental technique for storing flammable chemicals. The federal government also recommends fire suppression systems, such as sprinkler systems and fire extinguishers attached to the steel chemical storage buildings. Fire suppression systems provide a safe and reliable way of maintaining and monitoring your chemical storage facility. In the event of a fire there is the ability of contamination or even explosion. With a fire suppression system you can decrease the chances of a hazardous situation. US Chemical Storage provides 100% hand-welded, heavy-gauge steel for increased safety and compliant measures. Our continuously welded heavy-duty steel is extremely durable and exceeds OSHA, NFPA and EPA requirements. Our flammable chemical storage buildings meet all FM Approval and Warnock Hersey standards. Providing you with the safest and most secure flammable chemical storage facility there is to offer. 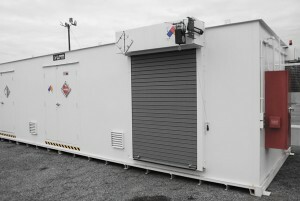 Optional accessories such as fire suppression systems are very popular among our flammable storage containers. We also provide a number of 100% customizable chemical storage accessories to make your chemical storage safe and compliant. Some optional accessories follow: mechanical ventilation systems, temperature controls, lighting, ramps and more!